Again in 2011 France presents us with a masterpiece of cinema. A daring film, magnificent, a true poem in animated form! 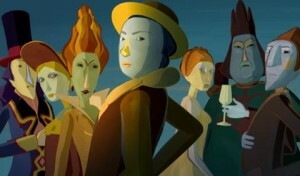 After offering us "The Artist" - silent film and black and white - in the first half, the French cinema in the 2011 harvest revels now with "Le Tableau": a 2D animated film, without using technology as its main weapon , gives a ball in many 3D's that prize. Driven by a magnificent original music (Pascal Le Pennec) and a highly philosophical and original screenplay, Jean-Francois Laguionie presents us, this holiday season, a wonderful art film. The whole movie is an originality and beauty can lead us, viewers, the French poet Pierre Reverdy called a day of "shock poetique." The story begins in an environment where coexist three categories of characters: "Toupins" (the whole painted), the "Pafinis" (unfinished) and "Reufs" (blanks). The "Toupins" feel superior by his appearance ended and composed of different colors. They are, therefore, that dictate the rules of the table, being also the only ones able to enter the castle, to attend their dances and their beautiful colors. In the dark forest surrounding the castle, painted with dark colors cooler and live the "Pafinis" and "Reufs" the characters of the marginalized "quadrociedade." It happens, however, that a "Toupin" - Branch (Adrien Larmande) - will fall for a "Pafinie" - Claire (Chloe Bertier) - and begin to question the status quo of the frame where you live. Because the fact of being more or less painted painted makes someone more than others? Who said this? Based on what? And the leader of "Toupins" tries to convince everyone that they were chosen by the Painter. They are the elect of the Artist, the "all-colored", who would compose the picture in all its fullness and beauty! Forever and ever! Thus, Branch is arrested for her defiance. But escapes and ends up being chased. With the help of Lola (Jessica Monceau) - a "Pafini" - and Plume (Thierry Jahn) - a "Reuf" - they break the boundaries of the table, trying to find the painter, only being able to restore order and equal in the frame. They believe that once all painted, peace will reign in those parts. Then there begins a poetic adventure, in which representatives of the three "quadrociedade" will go through various tables in search of its Author. The whole idea of ​​the film is beautiful. The dialogues are very intelligent, deep and philosophical! The question of the relationship between an Author and his Work is very present! Outside, of course, the whole question of divine creation, the equality of races, etc, etc, etc.. Special mention to the dialogue between Lola and "Autoportrait" Artist - which is, incidentally, played by the Laguionie). Magnifique! As for the aesthetics of the film, his plans are beautiful paintings, Fauvist, Expressionist ... beautiful homage to Matisse, Gauguin, Picasso and many artists of the modern world! A must-see movie for all who appreciate the fine arts, music, poetry, philosophy and beauty! ~ By Lilia Lustosa on December 26, 2011. 2 Responses to "Le Tableau (2011)"
Fine site, recommended by Prof.Clelia. I really enjoyed it! Showing foreign films, which are quite far from our screens, but would be very interesting to remember that some good has already passed through here (Brazil) Anyway, congratulations! Enos, thanks for the comment! I recognize that there is very little about Brazilian film ... I promise to increase soon!